[MC] I am speaking with Jeff Clark on a beautiful day outside his new shop, Mavericks PaddleSports at Pillar Point Harbor. 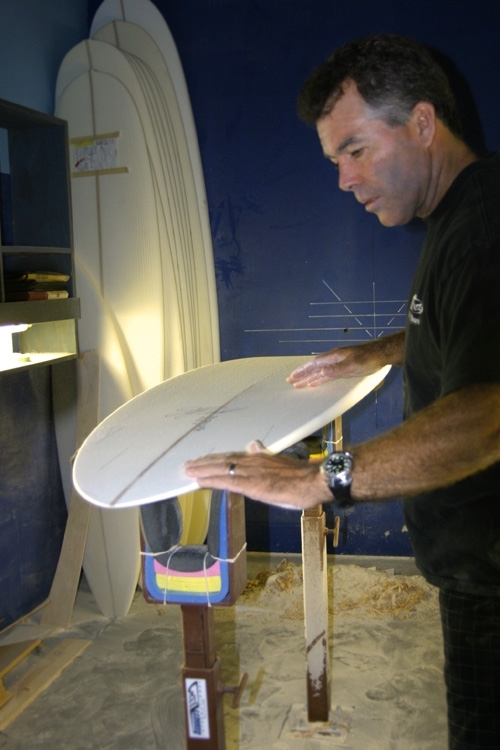 Jeff, what is your philosophy and approach to a custom surfboard design? [Jeff] When somebody comes to me and they want a custom board, I want to be educated on what they have in mind for their custom board. I have them bring me the boards that they’ve been riding and explain to me their experience when riding each one of those boards. I know how the boards work through experience and by looking at them, but I want to see what their experience is on that same board. And that will also tell me what surfing level they are — a beginner, intermediate, advanced or professional. [MC] Do you also ask them where they like to surf and what type of waves they surf? [Jeff] Yes. The type of waves and the type of boards that they surf are important for me to be able to interpret what they want. If they want a board for Pipeline, then I know that they’re a professional surfer, or surfing at a high level. [Laughs] I know what that wave does. That’s one of the heaviest waves on the planet. [MC] Do you shape a lot of boards for professional surfers? [Jeff] I do, but the professional surfers that I shape for are riding Mavericks or Puerto Escondido, really big hollow waves. They need a very high performance board. [MC] So is the Big Wave Gun your favorite board to shape? Is that your signature board? [Jeff] Actually, high performance boards are my favorite boards to shape. But it doesn’t take away the fun of shaping someone a board that’s going to take them to the next level. [MC] I’m glad you mentioned that because you created what you called the “Step Up” board for me, and I’m more of an intermediate surfer. What was your philosophy or your vision behind the “Step up” board? [Jeff] A lot of shapers, I find, will not build the intermediate surfer a high performance board. And that puzzles me because a high performance board can work in all conditions. It might have a little less volume compared to a high performance short board for an advanced surfer, because that board takes a little bit more weight here and maybe over the back foot for somebody that’s very tuned into that. But I can take my high performance short board and add some bottom contours that will help the beginning or intermediate surfer because that person doesn’t have that acute pressure knowledge from front to rear and rail to rail. Those adaptations will help them surf at another level. I know the board will work if they can get it on a wave! I had a woman come to me from San Diego and show me her boards that she’d been riding. Those were the clunkiest boards I’ve ever seen! They were so clunky that they were hard to paddle, and they were complete beginner boards. I wouldn’t make a board like these for beginners. But in someone’s mind, that’s what they thought she needed! The board I built her was more high performance and maybe a little longer because I wanted to give her the boost in paddling. She wanted to ride a little bit bigger waves like 6-8 feet, so I built her a 7’6” pintail. It is something that I could go ride in a 10’ barrel, so I know that she was could ride this board in 6-8’ soft waves in San Diego. And I discovered that this board is going to go through the water so purely that it would let her be in situations on waves where that board would light up and shine. The boards that she was riding before were holding her back. They were hindering her ability to get with the next level that she wanted. [MC] Well that’s definitely been my case with the board that you shaped for me! I’m curious about the materials that you use in your surfboards and do they vary by the type of board? [Jeff] Since Clark foam [no relation to Jeff Clark] went out of business years ago, it has opened up the world to any and all cores that you can build surfboards out of — from Agave to Balsa to Redwood to EPS foam — and different weights of foam and combinations of materials. Plus, there is the broad use of epoxy resins, which are very easy to work with and less toxic than Polystyrene. And they’re much stronger. [MC] Epoxy boards are becoming more and more popular. Would you say that you prefer working with those materials more than the traditional glass? [Jeff] I do because I like where it’s going, and I can build bigger boards that weigh very little so I’m in control of where I want to put the weight in the boards. 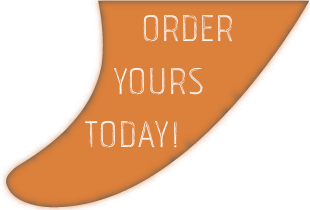 I can customize everything from nose to tail to just making them real special. It allows to me to completely customize a surfboard. [MC] And you do some amazing artwork as well. Mine is beautiful! [Jeff] I’ve got some great artists that have made my boards really shine. Mark Avena, he’s been the artist in the past that’s done some just unbelievable artwork. I’ve moved my shop to Ventura from San Diego and we’re going to put those designs into my new boards. Now I’m going to be able to do some of the artwork myself, letting me get artsy and creative with resin tinting and things like that. [MC] That’s awesome! Do you do any custom fin designs on your boards? 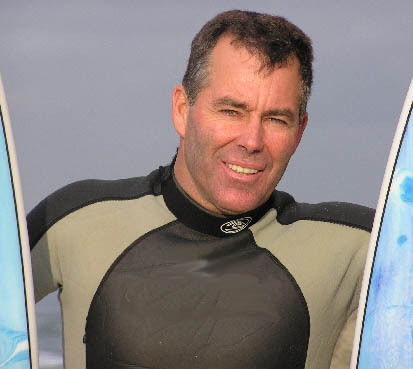 [Jeff] I’ve been using Futures fins, and I’ve designed a quad setup for SUPs as well as surfboards. I also have a signature tri-fin setup for big waves, and a combination of fins on the big-wave quads are a really good setup that I’ve been riding. [MC] The other day I saw a tri-fin setup on a big wave gun, and I was surprised that the fins were actually quite short. For some reason I thought for that size of a board they’d be longer. But they’re not, they’re relatively short fins. [Jeff] Yes, with boards that are going 30-35 miles an hour, if you have too much fin sticking out of the bottom, that will cause too much drag. There’s a fine line between shaping a big wave gun and having the board be in control with the fin combination. You have to have the board and the right set of fins so that you can survive critical situations and find a magic that gives you the freedom to draw your lines on that giant wave canvas. [MC] That’s poetic. Now let’s talk about your approach and philosophy to shaping SUPs. [Jeff] SUPing has been just the most fun thing I could do. When was the last time you felt like a grom? Or that you really sucked at something? [Laughs] Jump on a SUP and try and paddle in the ocean. It’s a humbling experience. But also, it’s one of the most rewarding because, if you stick with it, you will accelerate in your performance very quickly. SUPing is one of the quickest things you can learn, and the freeing thing about using a SUP in Northern California is that our water is cold. If I were in Hawaii I’d be all stoked to go surfing because the water is 70 degrees. But in Northern California where it’s 52 degrees, it’s brutal! On a SUP you're not sitting in frigid water. In the early days I watched the guys in Hawaii stand up paddleboarding, and their boards were the heaviest things that I’ve ever seen. I picked up a board and I thought I don’t ever want to ride something that weighs this much. It’s as heavy as my jet ski! [Laughs] So I thought, I can build my own boards. I decided to build them like I wanted to ride them. I sent a file over to get it cut, and they told me that it’s got way too much rocker in it and I can’t do this. But I’m thinking, wait a minute, who makes the rules here? That guy doesn’t know what he’s talking about or me! And maybe I don’t know what I’m talking about either, but I know the ocean really well. And I know that if I want something to work on a wave, it’s got to have curve. I know how to build curves for waves. So I built my first board and within a few sessions I was out riding waves. But I’m not the normal surfer. 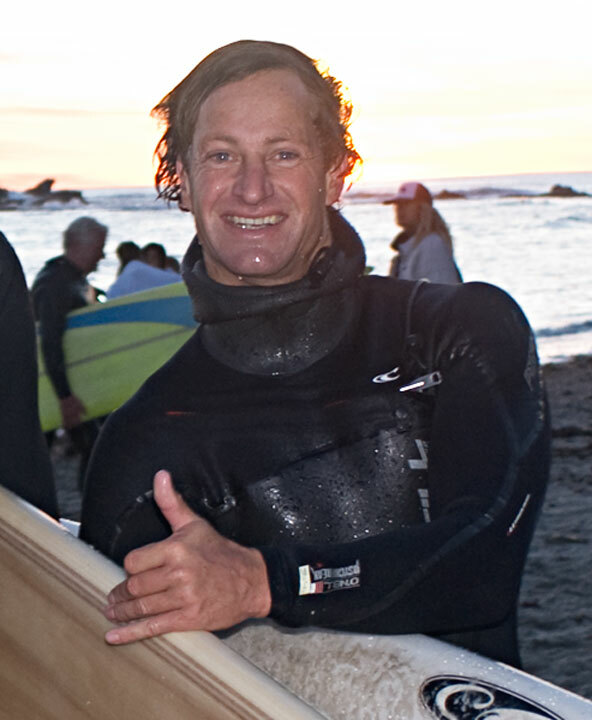 I'm ambidextrous (switchfoot), and I also did a lot of wind surfing in the early 80’s when it first came out, and I windsurfed competitively for about 6-7 years. I did slalom racing, course racing and wave sailing. So I understand the concept of wind, waves, big volume boards, speed and the importance of fins. We design and shape our own fins on our SUPs. I know a lot about it because I used to lay out all my own fin sheets and cut my own fins out and foil them to my own specifications so that they would work on the big wave guns at Mavericks. These are fins that are happy going 30 miles an hour with freedom and control. [MC] Nice. For the SUPs the fins are much longer. What is your approach to a SUP fin set up versus a surfboard? [Jeff] The fins I use are larger than on big wave guns. I’ve mostly been using a quad fin set up with side keel fins, and the center fins are just small 2-inch fins. So the center fin acts like a sending unit to let you know what the attitude of your board is going from rail to rail. Like a leveling screen in an airplane. It shows you the attitude of the wings in relationship to plumb to straight up and down. With the twin-fin setup, most of them have nothing between rail to rail. And so the fins are engaged on one side and they’re in no man’s land and then they’re engaged on the other side. With a quad fin setup, this small center fin solves that problem. [MC] Have you studied aerodynamics in relation to surfing? [MC] So the ocean is your lab? [Jeff] Yeah! There’s no better lab than in nature! My whole life, I’ve had an analytical approach to the ocean. Like with Mavericks, my mind was wondering why this wave is breaking the way it is. Then at minus tide, I could see the reef and know exactly why it broke the way it did. Eventually, what we figured out is that a wave coming in is basically 3D sonar. So you’re getting a visual of something sweeping through, like sonar, but then you’re getting a sounding wavelength that is bouncing off the bottom of the ocean. You’ve got the wave moving across the surface and then you have the dimension of the wavelength extending down to the bottom and as it gets closer to the shore, the bottom side of that wavelength starts to drag on the bottom. The closer and shallower it gets to the beach the bottom drags to a point where it pushes the wavelength up—the bottom slows down and the top curls over and the wave breaks. [MC] That’s pretty fascinating. You have mentioned wind and how it relates to surfing, wind creates different types of waves? [Jeff] Yes when you study the science of waves, waves form from the low pressure out in the middle of the ocean, and start to develop this counter-clockwise spin in the Northern Hemisphere and clockwise in the Southern Hemisphere. Here, it’s a counter-clockwise spin and low-pressure area as the pressure deepens. For Mavericks, we watch it come out of the Northwest Pacific and it moves lower into the Pacific and it starts spinning. What we’re looking for is the fetch, which is the bottom side of the low-pressure area. If this is aimed at Mavericks over a thousand miles with winds sustained at 50 MPH plus, we are going to see if it lasts a thousand miles. If it does, we are going to have two days of waves at Mavs. And this comes from studying the weather maps and then being at the beach when those waves are supposed to hit. You study the buoys and know that the precursor of the swell is starting to hit the buoys. So say the first precursor is at 22 seconds, and this storm is a thousand miles deep. 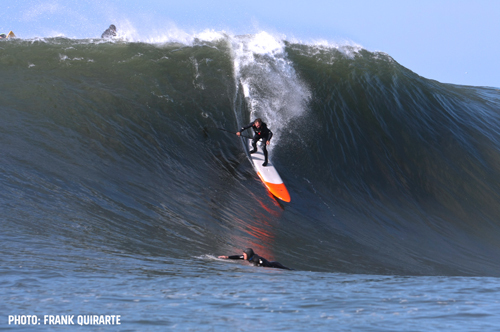 When the first wave hits, it is going to take somewhere in the neighborhood of 18-20 hours to reach Mavericks. It’s crazy! [MC] We were talking about the SUPs you shape. I’m curious, does anyone ever SUP at Mavericks? [Jeff] Yeah, I love SUPing out at Mavericks. I’ve built some big wave SUPs out of my regular big wave guns and added some width and volume so that you can stand on them and drop in and make the waves. There are some different things you need to put into SUPs so they have the breakaway speed because it’s a much bigger craft. [MC] Right, a SUP can be a little sluggish compared to a gun. [MC] What do you mean by "building in breakaway speed," is that the contours on the bottom of the board? [Jeff] Building in the contours at the bottom creates the lift and the freedom so that water does not stick to the bottom of that board. But yet, you’re going 35 miles an hour and you have to keep this big board in control. Right? It’s a combination of shaping and the right fin setup. I’ve never been a fan of just adding weight to a board if it won’t stay in the water. I’m thinking with all the technology we have today, you can use design to solve those problems. And I’ve watched time and time again, guys just adding weight. I’m not that guy. Weight definitely comes into play. You have to have a balance of weight and design so that you have stability, but yet freedom of speed, control and direction. [MC] That makes sense. Because you still surf and have spent your entire life surfing and studying the ocean, have you been able to take your experience and incorporate it into make better surfboards? And do you think this has given you an advantage over other shapers who have not spent as much time in the water as you? [Jeff] Yeah, I spend a lot of time out there and spend a lot of time designing and writing down everything that I shape. Even if it was a new, off the hook idea, I could go ride it and I would know what was wrong with that design, versus working on feedback from somebody else. I think that makes a big difference in choosing a shaper, especially for performance. I see a lot of big wave guns designed by guys who have never surfed a wave over 8 feet. I want to ride every shape I design so I know exactly how it performs from my own experience. And there's added feedback from team riders like Grant Washburn, in the early days and even now he would try out a board and tell me, “Wow, that board is insane, clone that one!” And then I built some guns for Chris Bertish, and he has a kind of a unique style and different demands of his boards. [MC] And he’s a much different size than Grant! Do you factor that into your designs? For SUPs, my goal is to build a board that I can surf waves like on a shortboard. It’s taken me a few years to get good enough to hit the lip get barreled and do floaters on a SUP. You have to learn how to use the paddle and if you’re adept at it, it starts to come really quickly. [MC] Tell me more about the paddles. [Jeff] The paddles are fit to your height and discipline. If you’re long distance paddling you’re riding a thicker board and using a longer paddle for a longer stroke. But for me, when I’m going out and surfing the beach breaks in hollow, demanding waves, my center of gravity needs to be lower so I ride with a paddle that’s head high. That way I can stay low when I’m dealing with chop and waves and white water, and my paddle is not too tall and it doesn’t stand me up to an off balance position. [MC] I read that SUP’ing is the fastest growing water sport right now. Are you shaping a lot of SUPs versus surfboards? [Jeff] I am making a lot of SUPs. SUPing here at Pillar Point Harbor, which is one of the safest waterways around, is a great place for beginners. [MC] And then you can get as advanced as you possibly can at Mavs just around the corner. It’s a pretty unique place for SUP! [Jeff] Exactly! So for my shorter SUPs I may shape a 7’3” or shorter, for a really good lightweight surfer. But for me, because I weigh over 200 lbs, mine is over 8’. But it only weighs about 14 pounds so it’s extremely light, and I can rip it around like a shortboard! Right now I’m also designing and building boards and downwinders for surfing downwind and catching swells and doing some distance stuff with the wind. They’re great for surfing the wind chop out in the middle of the ocean. That’s just a blast! All the boards are really different; they’re all over the map. I’ve incorporated the concave bottom and I have built boards that have triple concaves and tri-rails. I’ve used some of the boat technology and aerodynamic technology. I’ve spent so much time in waves, sliding down the waves and feeling that energy. I constantly wonder what I can adopt to tap into that. How can I harness that energy source? What kind of shape can I come up with to slide down vertical water? It’s really been a fun! [Laughs] My mind does not tire of thinking about these things. The other day I sat on my computer working on designs for six hours. I love just messing with designs and when I come up with something that’s pretty different, I’ll just put it away and then I’ll go back to it later or when I see something in a dream. [MC] You even dream about wave designs? Copyright 2016 Mavericks Surf Company. All Rights Reserved.